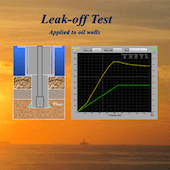 This app provides for Technicians, Drillers, Toolpushers, Drilling Engineers, Students and others professionals of the oil industry a very helpfull tool to analysis and use during the performing of the leak-off test in wellsite. 8. Tap with finger and moving it in the graph area to obtain Choke Pressure, Equivalent Density, Equivalent Gradient, Volume Pumped and Pumping Time.